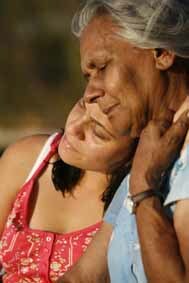 Custard tells the story of a young Aboriginal woman who visits her grandmother after the death of the grandfather. She is looking for answers to her many questions. Although a sad film it is not without humour when the granddaughter reads out a 'modified' death certificate where the old man died of an overdose of custard. Custard is based on a true story and set on beautiful Stradbroke Island in Queensland, home of the director Michelle Blanchard. Still from the film 'Custard'. Director Michelle Blanchard says about her film: "Grandma's house is two miles from town and the majority of people in town would have probably been in her kitchen for a cuppa. Perhaps they used the same chipped cup as me and no doubt fiddled with their own spilt sugar on the tablecloth. "Yet, every time I'd sit in that old fibro house, embroidered by huntsman spiders and cracks in the floor, I didn't want to be anywhere else in the world as we'd sip our tea, smoke "winnie reds" and listen for the sound of another barge pulling in and hear the wheels of another thousand four wheel drives rolling effortlessly onto the island. Michelle Blanchard is an Indigenous woman, descendant of the Nugi and Nunnuccal clans of North Stradbroke Island (Minjeeribah), Queensland. She also is a writer and lectures Aboriginal Studies at Sydney Uni.